A cake can do a lot of things. It can celebrate birthdays, anniversaries, weddings (though I’m totally thinking pie), promotions, gigs, and babies. It can brighten up 3pm slumps at the office. It can acknowledge deaths (I’ve often been served cake at wakes). But a cake can’t save lives. It can’t move mountains. It’s food, but it can’t feed the hungry. It can be rich, but it can’t pad the pockets of the poor. It can be neither roof over head nor blanket for bed. But for me, this cake can restore patience. Or, at least it could temporarily restore it. I’ll take it. It’s not complicated to make. It’s not intimidating. But it does take time. It has parts: There’s cake, there’s soaking syrup, there are two fillings, there’s a topping, there’s a garnish. There’s a lot of currant plucking. And for that I am grateful. The reward is a clear head and a damn good slice of cake. 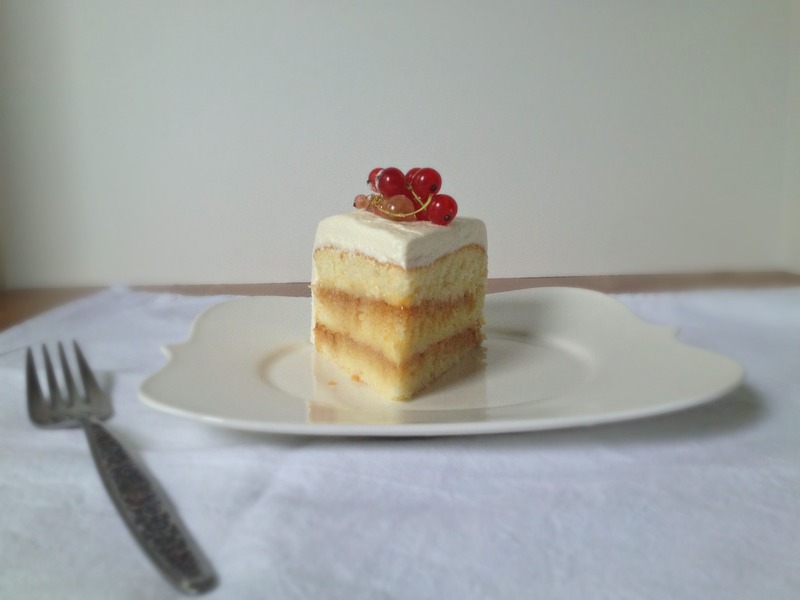 A light-as-a-feather, fluffy, flavorful but restrained slice of cake. I think that currants work most beautifully with eggy, vanilla-flavored things, which is why I got that sensation. The tartness shines through but is lightly tempered by smooth, rich pastry cream, making it a common tart topper. It doesn’t require a bunch of other flavorings, so sweet vanilla does the job. And that’s it. That’s how this cake was born. There’s little to say about this cake that isn’t simply captured in the description: Thin layers of my chiffon cake that I swear will never fail, Crème de Cassis syrup, currant caramel (yes, currant caramel), vanilla bean pastry cream, whipped cream, currants. The currant flavor is pervasive but in different ways: The liquor in the syrup provides the warmth and spice of black currants, the dark caramel is bittersweet from deeply cooked sugar and tangy from vibrant red currant puree that is added with the cream, and the red and white currant garnish is popping with freshness. I can never figure out why fruit caramel sauces aren’t more popular. On this blog, I also have a peach caramel that I used for another cake, and I just love how the deep caramel notes mingle with fresh fruit and give any dessert a touch of sophistication. So, to patience! But, mostly, to cake! Because really, that’s why we’re all here. I don’t provide a hard-and-fast amount of syrup for each layer; this chiffon is so naturally moist, fluffy, and delicious on its own, so you can use as much or as little as you like. If you want to “semi-stabilize” the whipped cream frosting, reserve ¼ cup of pastry cream filling and add it to the cream when you’re whipping it. 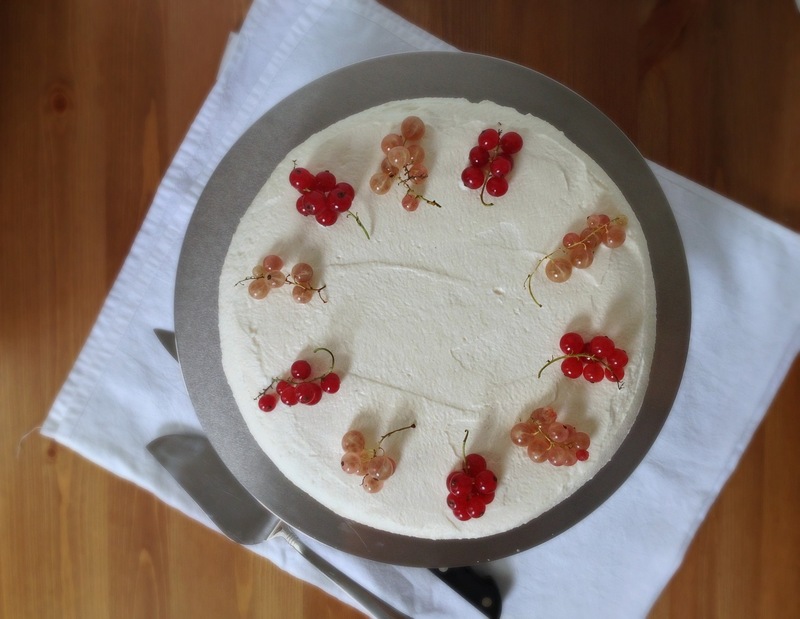 This cake looks lovely when decorated with red and white currants still on their stems. I removed the stems from additional currants and served them in a bowl alongside the cake so guests can spoon them on top. 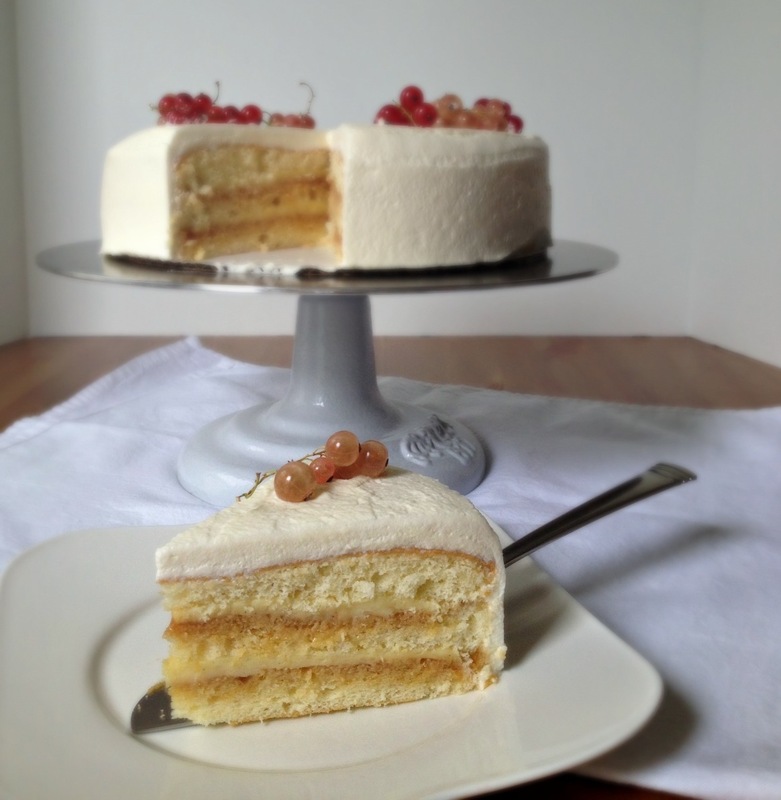 You want to eat the cake with whole currants on top because their tartness and burst of freshness are integral to the final dessert. Scrape seeds from vanilla bean. Bring milk, vanilla bean seeds and pod, and salt to boil in small saucepan. Remove from heat, cover saucepan, and let sit for at least 10 minutes and up to 1 hour to infuse with vanilla flavor. 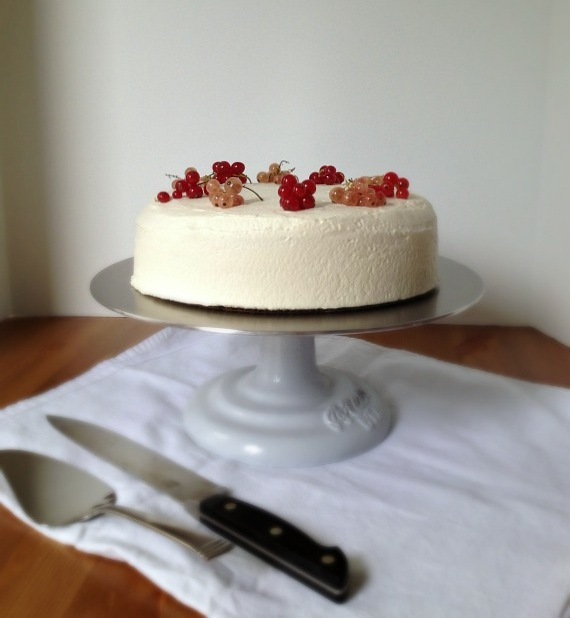 Because of the high level of pectin in currants, the caramel takes on an almost jamlike consistency, which is lovely for spreading it between the cake layers. Leftover currant purée is tart and vibrant and wonderful stirred into yogurt or drizzled over ice cream. It can be stored in the refrigerator for up to 7 days. Combine currants, 1 tablespoon sugar, and 1 tablespoon water in small saucepan and stir to coat currants in sugar. Bring mixture to boil over medium-high heat, then reduce to simmer and cook, stirring frequently, until currants have broken down, about 10 minutes. Strain currant mixture through fine-mesh strainer, pressing on seeds and skins to extract liquid; set currant purée aside. Using mixer (fitted with whisk attachment if using a stand mixer), whip cream, vanilla, and salt together on medium-high speed until cream begins to thicken. Sift sugar over cream and continue to whip until stiff peaks just begin to form. I love the idea of a cake that can restore patience. This looks so pretty! I wouldn’t think of pairing currants with caramel but it sounds absolutely lovely. wow. this definitely takes patience- but looks absolutely worth it! you know what, though, i have never tried currants. now you have me curiuos!! Pick some up before they go out of season—I think you would like them! You like rhubarb, which means you can appreciate some tartness in your fruit. That is so wonderful. And currant caramel? Fabulous! We never, never see them local here. On rare occasions, I think in winter mostly, I find them in Whole Foods. 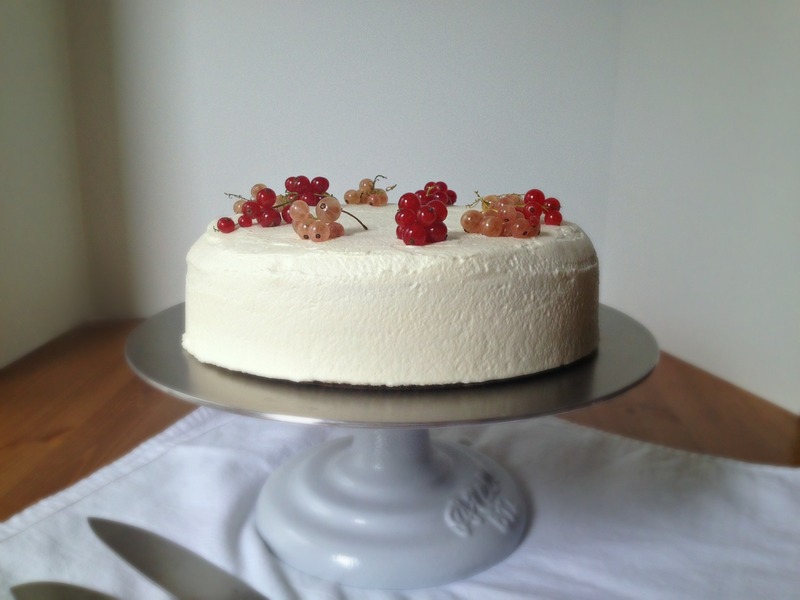 Even if they’re from the far ends of the earth (which obviously they would be), next time I see currants, I am definitely making this. We’re so lucky to have them up here.